Audience Only Registrations period has ended. 20:00-20:30 Reading Registrations period has ended. 20:30-21:00 Reading Registrations period has ended. 21:00-21:30 Reading Registrations period has ended. 22:00-22:30 Reading Registrations period has ended. 22:30-23:00 Reading Registrations period has ended. 23:00-23:30 Reading Registrations period has ended. 23:30-00:00 Reading Registrations period has ended. 00:00-00:30 Reading Registrations period has ended. 00:30-01:00 Reading Registrations period has ended. 01:00-01:30 Reading Registrations period has ended. 01:30-02:00 Reading Registrations period has ended. 02:00-02:30 Reading Registrations period has ended. 02:30-03:00 Reading Registrations period has ended. 03:00-03:30 Reading Registrations period has ended. 03:30-04:00 Reading Registrations period has ended. 04:00-04:30 Reading Registrations period has ended. 04:30-05:00 Reading Registrations period has ended. 05:00-05:30 Reading Registrations period has ended. 05:30-06:00 Reading Registrations period has ended. 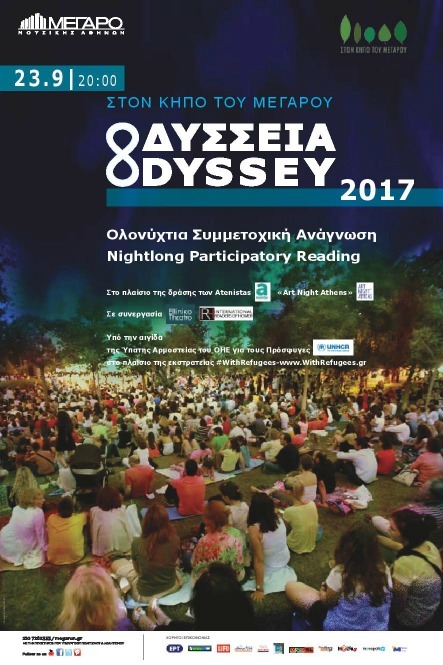 Athens Concert Hall presents ODYSSEY 2017: A Nightlong Participatory reading of Homer's Odyssey. Organized by EllinikoThεatro and The International Readers of Homer, the reading is a collective celebration of the joy and power of great poetry read aloud. Under a canopy of ancient stars, over 200 readers will lend their voices to the timeless tale of the wandering hero and his homecoming. Be one of the 200 Readers! The event is under the auspices of the United Nations High Commissioner for Refugees (UNHCR) and is dedicated to the odyssey of refugees hosted in Greece and elsewhere. In addition, the Reading is part of Atenistas’ “Art Night Athens” event on 23/9, inviting Athens residents to discover new facets of their city in a variety of art and culture organizations from 8pm til 6 in the morning the next day. Similar Readings have taken place in the context of the London Olympics, the European Commission of Culture in Brussels, the Library of Alexandria, the Getty Villa Museum in Los Angeles, the 92nd Street Y in New York, the Portland Art Museum in Oregon, and also in Sacramento, Montevideo, Troy, Kos, Chios and dozens more locations worldwide thousands of participants. Readings do not have to necessarily be performed individually. We encourage you to perform with friends, family, teachers, co-workers! The week before the Reading we will be hosting open rehearsals/workshops for the Readers with the teams of EllinikoThεαtro and the International Readers of Homer. Once you have successfully registered you will receive further information about the Reading via email from odyssey2017@ellinikotheatro.org, while Readers will receive their assigned 2-3minute passage and information on the open rehearsals/workshops. Help us make sure to reach you by adding this address to your Contacts. Your personal data will not be shared with or sold to third parties. The show will be recorded and broadcast live on the internet. Readers may be photographed by professional photographers during the reading. Photos may be used for archival purposes and future promotion and presentation by EllinikoThεatro and the International Readers of Homer. The photos and video of the show may be used by local and international press. The ticket purchase automatically accepts the above terms.